A recent article in the Journal of Oral Implantology studied the stability of dental implants in women with osteoporosis who also use bisphosphonates. The researchers found that bone loss among these women could be managed when the implants were inserted immediately after removing teeth. The authors concluded that by inserting implants soon after removing teeth, it is possible to decrease the risk of BRONJ among patients with osteoporosis. Journal of Oral Implantology – As natural as aging is, it can tend to feel like a downward spiral. As the years increase, bone mass and strength decrease. Teeth can fall out, and the drugs and surgery designed to return things to normal may actually make bone related issues worse. Osteoporosis is a common problem for women who have gone through menopause. Due to the disease, they lose bone mass and strength throughout their bodies, including their jawbone. The most common treatment today for osteoporosis is a class of drugs called bisphosphonates. But these drugs can have major complications that affect already weak bones, preventing them from getting blood and thus causing them to die. When this occurs in the jawbone, the complication is known as bisphosphonate-related osteonecrosis of the jaw (BRONJ). The authors of an article published in the Volume 41 Special Issue of the Journal of Oral Implantology wanted to know whether a patient managing osteoporosis with bisphosphonates is at greater risk of experiencing this serious complication in the jawbone. They looked at patients who were 54 years of age or older and were receiving dental implants. The authors then compared the success of those implants in patients with and without osteoporosis. The current study followed 24 postmenopausal women who had lost most of their teeth. Half of these patients had osteoporosis and were taking the bisphosphonate zoledronic acid once a year intravenously; the other half did not have this bone disorder and did not take the drug. Dental surgeons extracted all of the remaining teeth from each of the 24 women and immediately replaced them with dental implants. They examined them one year later to determine whether the implants were working. The results were completely successful: the researchers found that all of the implants were still in place after one year. There was some bone loss, but it was similar in both groups of patients. There were no signs of dead bone among the patients who had taken zoledronic acid. All 24 women in the study had good contact between the surface of the implants and the bone. The authors found that installing the implants immediately after extracting the remaining teeth reduced the number of surgeries, sped up the overall process, increased patient comfort, and produced good results even in patients with osteoporosis. The authors concluded that by inserting implants soon after removing teeth, it is possible to decrease the risk of BRONJ among patients with osteoporosis. They noted that patients taking such bisphosphonates should avoid elective oral surgery, but if it is essential, it can be successful. They recommend implant surgery immediately after tooth removal, calling it a “safe treatment modality” for patients with osteoporosis. 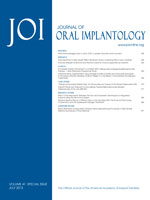 Full text of the article “Immediate Implant Placement in a Patient With Osteoporosis Undergoing Bisphosphonate Therapy: 1-Year Preliminary Prospective Study,” Journal of Oral Implantology, Vol. 41, Special Issue, 2015, is now available.